There’s nothing better than seeing your pup happily splashing about in a creek or river, especially in the greater D.C. area’s unbearable summer heat. But toxic blue-green algae has been found in a number of local waterways in the past few weeks, so be very careful where you let your pup paddle. The Northern Virginia Clean Water Partners-sponsored Northern Virginia Dog Blog posted about the danger a few days ago. Microcystis aeruginosa, a blue-green algae species that produces toxins known as microcystins has been found in Aquia Creek in Stafford County. The algae can be toxic to both humans and animals if ingested and is potentially fatal to pets. The county has a civic alert on it’s website that advises pet owners that if their pets do come into contact with the water in Aquia Creek, they should be prevented from licking their coats and bathed as soon as possible to remove any blue-green algae or toxin that may be entrapped in their coats. 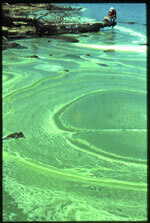 Blue-green algae, photo from the Va. Dept. of Health website. “Blue-green bacteria or cyanobacteria are single-celled organisms that naturally exist in fresh or salt waters. They use sunlight to make their food. When there are a lot of nutrients available in the water, the bacteria can grow rapidly or “bloom” to form a visible film or scum on the surface of the water. Cyanobacterial blooms are often green or blue-green in color although they can sometimes be red or brown.” The VDH has a web page with more information. The local CBS affiliate in Baltimore is also reporting that the toxic algae has also been found in the mouth of the Mattawoman Creek near Indian Head and the Potomac River south of the creek. 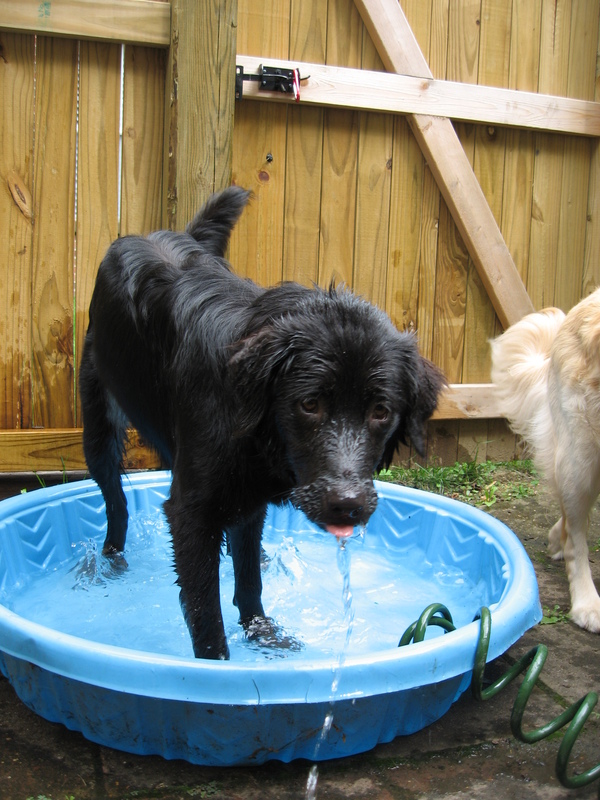 So, you may want to limit your dog’s splash time to a backyard wading pool for the time being. You can pick one up on sale for about $6 right now at Toys R Us or Babies R Us! Sundae splashing in a wading pool.